This is an Asian themed jewelry box that my wife and I designed together. 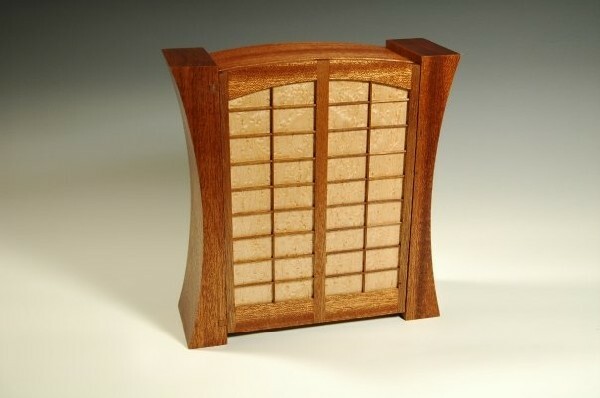 It is made of Meranti for the case, Birdseye Maple for the door, drawers, and back, and Bloodwood as accents in the segmented turning of the necklace carousel, drawer handles, and on the earring tree. Front Door – The front door is intended to look like a Shoji screen. The Meranti frame is constructed using loose tenons. 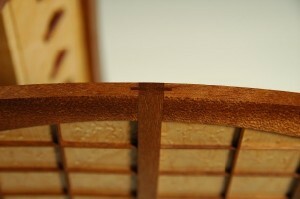 The Birdseye maple panels are beveled on the back by using a raised panel bit and dadoed on the front to receive the thin slats for the Shoji screen. Every one of the 34 pieces that make up the screen needed to be sanded to length to make it fit properly. Rare earth magnets are used in the door and the case to keep the door closed. They are hidden under a veneer made by using a plug cutter in the same Meranti used on the door. They are invisible in the pictures and are only seen when pointed out. Wood Hinges – This is my second project that uses wood hinges. They really add an interesting element to the project. My wife did not want to see the hinges at all when the door was closed. I would have used the barrel hinges but the door was too thin. (next time) Instead I used tiny pieces of Meranti that match the case and pinned them with a brass rod. The hole for the rod was filled with a piece of Meranti turned on the lathe so it was invisible too. There is a #4-40 brass screw that passes through the back of the wood hinge block into the door to give the connection strength. 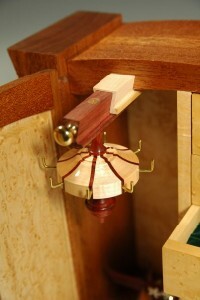 Necklace Carousel – The initial design of the box had a slide out panel with hooks on both sides for the necklaces. Because the panel was tall and narrow I was concerned about how well it would slide out since it would easily bind up as it slid out (aspect ratio issue) So I decided to have something hanging. I had just bought my lathe so I figured why not turn the carousel on the lathe. The segmented section was something I wanted to try too. The finial on the top/bottom are made of Bloodwood and have a wonderful chatoyance. The carousel was in tight quarters so I wanted to have it slide out. A single sliding dovetail probably would have been fine but I love the way the double sliding dovetail looks on the Incra wood block at my local Rockler so I figured I would give that a try. I used my benchtop milling machine to make these with the dovetail bit. There are little stops on the side of the pieces so it does not pull out and actually has a two stage motion like a full extension drawer slide would. A small #4-40 flat head brass machine screw connects the carousel to the slide. 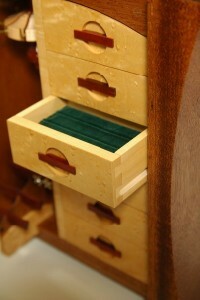 Drawers – The drawers are made of maple with a Birdseye maple veneer on the front. The veneer is a single piece that spans all the drawers. 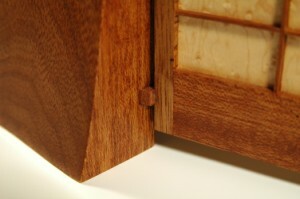 The drawers use half blind dovetails. The handles were made by using a forstener bit to cut the recesses, turning a stack of BE veneer on the lathe, gluing a veneer “disk” to the bottom of the flat hole, and then making the Bloodwood handles. The drawer bottoms are made of Meranti. Some of the drawers have ring bars from Rockler, some are empty and some are getting removable dividers. The drawers have little magnets in the back to keep the front face of the drawers all on the same plane. 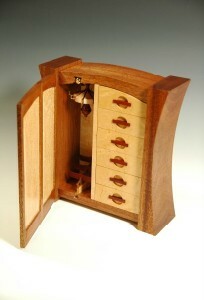 Small Meranti runners are morticed into the case and slots are milled in the sides of the drawers. I have a new appreciation for how much work goes into making drawers. 6 small drawers can consume the same amount of time as the rest of the project. 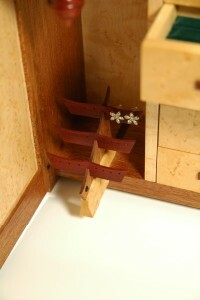 Earring tree – This was the last thing I made on the box. I had a problem that I needed to fix. I had cut the sliding dovetail for the bottom part of the necklace panel in the bottom of the case but when I changed the design to a hanging carousel I didn't have anything to fill the sliding dovetail hole. I played with idea of a little mirror that would slide out and actually built one but it wasn't really practical. The earring tree was the next idea. This design is intended to look like the roof of a pagoda. 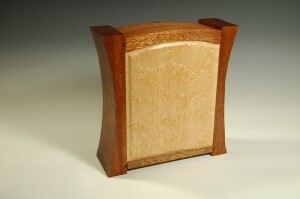 The sliding base is made of BE maple, the “fin” is made of Meranti and the tree limbs are made of Bloodwood. There is a tiny (1/8” x 1/8” x 3/16”) pull embedded in the fin made of ebony that has a pyramid shape on either side of the fin. Back – The back of the case was made of BE maple that was re-sewn, joined, and cut with the raised panel bit to give it some detail. 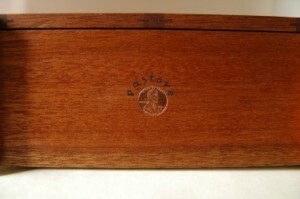 On the back of the box you can see the loose tenons used to joint the case. The entire case was intended to be about 1.5” deeper and these tenons would not be visible but I had to shorten the case when I made the mistake of not flipping the case sides as I was using the template bit to shape them. As I was climbing out of the arch it grabbed a piece of the wood and sheared it off. I was not pleased with myself but just changed the design and moved on. Case – If you have seen my Shaker Weave Fibonacci Box , you know that I like to use ratios and proportions that are pleasing to the eye. This project was no different. Many of the dimensions in this box use the same principles. This project included another ratio though for the arches. It uses something called the Waist to Hip Ratio (WHR). The WHR is the circumference of the Waist divided by the circumference of the hip of a person. There are studies that show that a WHR of .7 in women and .9 in men correlate with health, fertility, disease resistance, etc. Studies also show that when shown a sample of body profiles, people gravitate to these “healthier” (grain of salt) profiles and tend to find them attractive. An internet search on the subject will give more information. The WHR is the ratio of change between the thinnest part of a person (waist) and their widest (shoulders and hips). So, for the box, if you take the dimension measured across the front half way up (the waist) and divide it by the dimension across the front of the box at the top or bottom (hips and shoulders) you would get .7. Hope that makes more sense. Finish – The finish is 4 coats of Maloof oil/poly mix, 2 coats of oil/wax mix, and 3 applications of Briwax. Most parts were finished before assembly. Signature – I use a 3/4” forstner bit on the bottom to recess a 2009 penny and use a Sharpie to sign. I tried many new things, learned a lot, and had a good time on this challenging project.